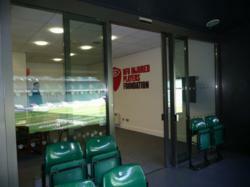 The commercial arm of Hazlemere Windows have been commissioned by the English Rugby Football Union to manufacture and install double glazed automatic aluminium sliding doors to the front of the RFU Injured Players Foundation’s VIP box at Twickenham. This RFU Injured Players Foundation’s (IPF) VIP box at Twickenham has been specially adapted to accommodate wheelchair users and their carers. The installation took place in time for the England v Wales rugby international on Saturday 25th February 2012, and will allow easy access to the viewing area outside the box for severely injured rugby players. This special hospitality area for players who sustained serious injuries whilst playing rugby union was completely redesigned and refurbished. This RFU Injured Players Foundation’s (IPF) VIP box at Twickenham has been specially adapted to accommodate wheelchair users and their carers. Conservatory Outlet dealer Hazlemere Commercial were proud to be associated with the RFU IPF, plus thrilled they were able to fabricate and install the commercial sliding aluminium doors on time for the official “opening” before the Six Nations Triple Crown clash between England and Wales. Hazlemere Commercial, based in High Wycombe in Buckinghamshire, specialise in designing, manufacturing and installing double glazing in Watford, double glazing in High Wycombe and double glazing throughout Berkshire and Buckinghamshire.